Stokesley is fortunate in having an attractive town centre, recognised as an area of special architectural and historical interest by being designated as a Conservation Area. [for map click here]. To help ensure that Stokesley keeps its attractive character, there are a number of planning controls and grants are also available. Property owners may well be uncertain how these controls may affect them and wonder how best to proceed when considering repairs or alterations. Recognising this problem, the Stokesley Conservation Area Advisory Group has produced this booklet to help you through the planning application stage, and suggest ways for avoiding problems. The Group advises Hambleton Planning Department on issues affecting the Conservation Area, providing a local perspective. To help you we have provided a box file in Stokesley Library, Reference Section which contains the appropriate leaflets and booklets necessary for planning applications, apart from those marked* in the lists that follow. There is also in this box - ‘Planning Resource Pack’ - that provides concise notes to help you find your way through the Planning System. While it is not written specifically for Hambleton, it provides a useful introduction to several topics. Another useful source of information in the Library reference Section is the Hambleton District Plan, so we have noted relevant chapters and policies in the Plan. Hambleton District Council has also produced a number of useful Planning Information Notes that are in the box and can also be obtained from the Council. Helpful telephone numbers can be found on the back page of this leaflet. The Conservation Area covers the centre of Stokesley along with Levenside, providing protection for the buildings and trees. Further protection is provided by what is called an Article 4 Direction, that requires that any change affecting the external appearance of a dwelling house is approved by the Planning Department. Outstanding buildings in the Conservation Area are recognised by being Listed: for these buildings, any change, internal or external, requires Listed Building Consent. There are grants, together with expert advice, available to help you retain the character of buildings in the Conservation Area through the Market Town Scheme, run by Hambleton District Council and the County Council. Grants are also available to encourage tree planting. The following sources provide more details on these topics. A map showing the Conservation Area and listed buildings is available in the website by clicking Location here or in the website pages. Planning Resource Pack: Sheet 7 Development Control, covers listed buildings and Conservation Area. Hambleton District Council Planning Information Notes; No.1 – Listed Buildings; No.2 – Conservation Area; No 5 – Conservation Area Preservation and enhancement Scheme; grants for groups wishing to carry out enhancement work in the conservation Area; No.7 - Tree Planting Scheme: describes available grants. 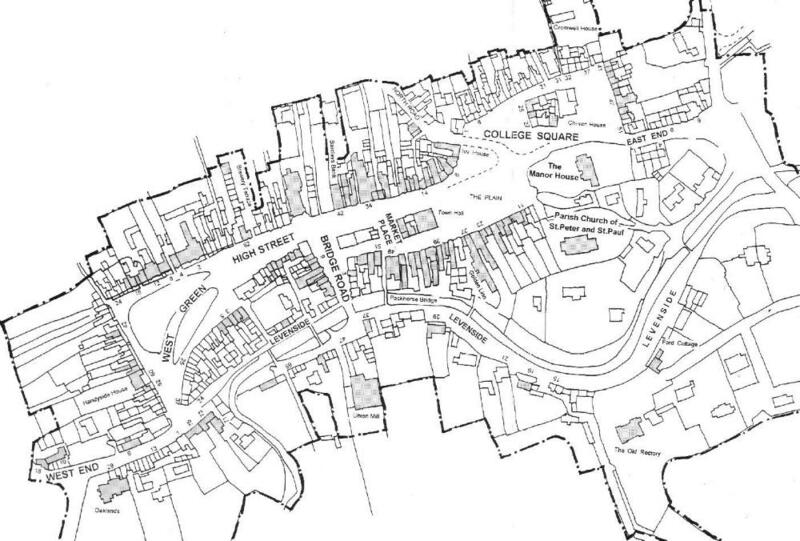 Hambleton District Council Note: Conservation Area Assessment – Stokesley, describes the special character and important features of the conservation Area and some ideas for development. Hambleton District Council Supplementary Planning Guidance: Trees: describes controls relating to trees in the Conservation Area. Extracts from Hambleton District Council Grant Information Guide: describes grants and how to apply. *The Hambleton District Council Plan can be found separately in the Library and covers the following topics in greater detail in Section 1, Chapter 5: Development in the Conservation Area; Article 4 Directions; Listed Buildings; Trees in the Conservation Area. If you are considering repairs or alterations that change the external appearance of a building then you should consult Hambleton District Council Planning Department on the best way to proceed. For Listed Buildings this also applies to changes proposed to the internal character of the building. Even for straightforward replacements it is worth consulting the organisers of the Market Town Scheme, as there could be alternative options – for example, the replacement of a casement window with a vertical sliding sash window that will qualify for a grant and add value to your property. The main guideline is to sympathetically respect the character of the building and its surroundings. Listed below are useful publications that will help to give you some background on the history and character of your property. Stokesley: A Place Worth Preserving, describes the character of the Conservation Area; available from Stokesley Book Shop at 25p, published by the Stokesley Society. *Buildings of Stokesley. A hardback handbook describing the features and development of buildings. Published by the Stokesley Society, in the Library Reference Section. Glossary of Architectural Terms. With illustrations (abstracted from ‘Buildings of Stokesley’) that could help when reading some of the more technical leaflets. Old Stokesley. A booklet of old photographs useful for establishing the earlier appearance of a building. Problems with Old Buildings in Stokesley. Includes sections with advice on roofing, walls, windows and doors. The Stokesley Society and Hambleton Planning Department has a collection of photographs that can help establish the earlier appearance of a building. Notes by the Society for the Protection of Ancient Buildings: Chimneys on old buildings and Technical Pamphlet No. 12 – The repair of Timber Frames and Roofs. Notes by the Society for the Protection of Ancient Buildings; Information sheets, No.1 Basic Lime Wash; No.2 Timber Treatment; No.4 The Need for Old Buildings to Breathe; No.5 Removing paint from Old Buildings; Technical Pamphlets, No.5 Pointing Stone and Brick Walling; No.8 The Control of Damp in Old Buildings. English Heritage Notes. Sash Windows and Principles of Repair; Door and Window Furniture, fittings for sash windows, also Security; Energy Saving; Window Comparisons; Draught Proofing and Secondary Glazing. Society for the Protection of Ancient Buildings; Technical Pamphlet No.13 The Repair of Wood Windows. ‘House and Cottage Interiors’ by Hugh Lander. Georgian Group Guides. No.4 Paint Colour; No.6 Wallpaper; No.7 Mouldings; No.9 Fireplaces; No.11 Floors; No.13 Lighting; No.15 Papier Mache. Hambleton District Council. Supplementary Planning Guidance No.6 Advertisements and Shop Fronts. Hambleton District Plan Chapter 6, Policy BD7 Display of Advertisements; Policy BD Design of Shop Fronts. Hambleton District Council Supplementary Guidance Department Guide No.1 Extending Your Home; No.2 Dormer Extensions; No.3 Residential Infill. Planning Application forms are provided by Hambleton District Council. It is well worth taking care as correct completion will ensure the application is processed as quickly as possible. Incorrect or incomplete forms could lead to your application being rejected or requiring modification. This can be a source of frustration, time consuming and cause your budget to over run. If you are in doubt on any points requested in the application, do not hesitate to telephone Hambleton District Council. The Planning staff have the relevant experience and expertise and will be pleased to give you advice. If a change is proposed, by others, in your vicinity, you may wish to comment on a Planning Application. Copies of applications are held by the Parish Council. You can also view applications at the District Council’s Stokesley office. You can post comments or discuss them with a member of the Parish Council. Planning Resource Pack Sheet No.5 Applying for planning permission; No.6 Commenting on planning applications; No.9 Small Businesses and the planning system; No.10 Redress.